Just drive through any Phoenix neighborhood and you’ll find home after home that features tile roofing. Some choose the clay tile that creates a classic Mediterranean look that is perfect for the desert landscape, while others experiment with options like concrete or slate tile that create a different look and offer other benefits. Here are a few reasons you should talk tile with your roofing company about the benefits of tile roofs! Tile is strong enough to resist some of the toughest storms and winds, which can batter Phoenix during the monsoon season. So long as the tile remains properly sealed, it will provide a water-proof barrier for your home, as well. Tile is resistant to extreme temperature changes — especially important during those hot Phoenix summers. It is also fireproof and resists rot and insect damage. In addition to provide this great protection, tile roofing will also last 50 years or more, helping you to save money on a roof replacement. The way tile roofing is installed on your Phoenix home, it creates a natural channel for air flow between the tile and the roof decking. This air flow improves the energy efficiency of the roof, keeping more cool air in during the summer and more warm air in during the winter. You’ll save money on your monthly utility bills and will do your part for the environment. Besides the energy savings, tile is also friendly to the environment because it is made of sustainable materials. You won’t be contributing to the depletion of natural resources when you purchase tile for your roof. Thanks to their long life span, the tile also reduces the consumption of new materials. One reason that tile roofing is so popular in Phoenix is that it looks beautiful. Tile can improve the curb appeal of your home, which will also improve the value of your home. Though tile can be an expensive roofing choice, the cost is more than offset by the improved value of the house, the longer life span of the roof, and the reduced repairs and maintenance that will be required. Before you choose tile for your home, it is important that you work with an experienced roofing contractor in the city of Phoenix. Tile is quite heavy, and you need to be certain that your home can support the extra weight. A contractor may need to install additional supports to accommodate your new roof. 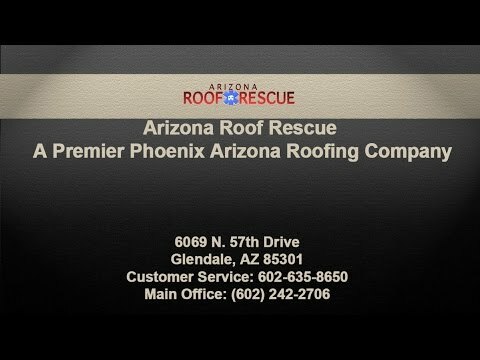 Arizona Roof Rescue can help you understand the right tile roofing options for your Phoenix home. Our contractors are experienced in installing all types of tile, including the popular clay, slate and concrete. We can install the roof and maintain it, helping it to last for many decades to come. We have a reputation for top quality workmanship and friendly service. Call us today to learn the difference that our experience and service can make. We’re ready to transform your Phoenix home.